In a collage style frame I keep snapshots from my first birthday spent with Josh, a birthday on the Illinois River, camping and floating and lazily enjoying the day. 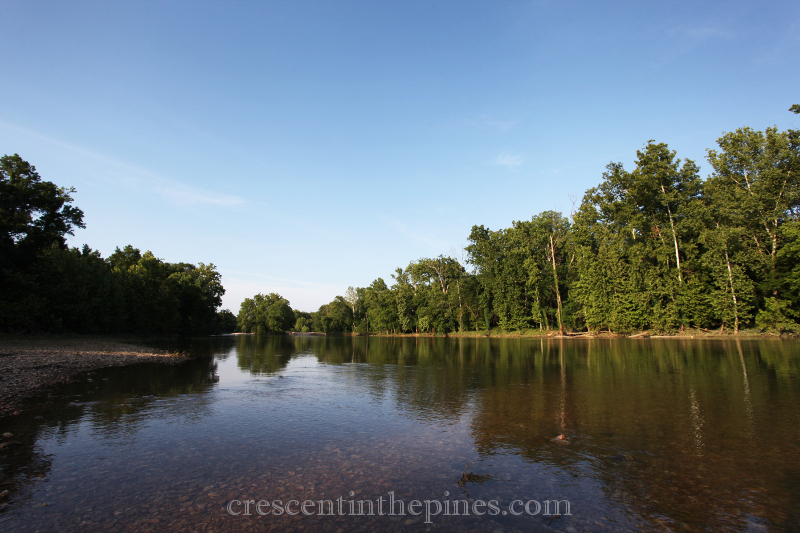 E frequently asks about those pictures, about “daddy’s river” as she calls it, one of his favorite places. And so, in spite of the river being up from all the rain, we decided to take E to her daddy’s river to camp. 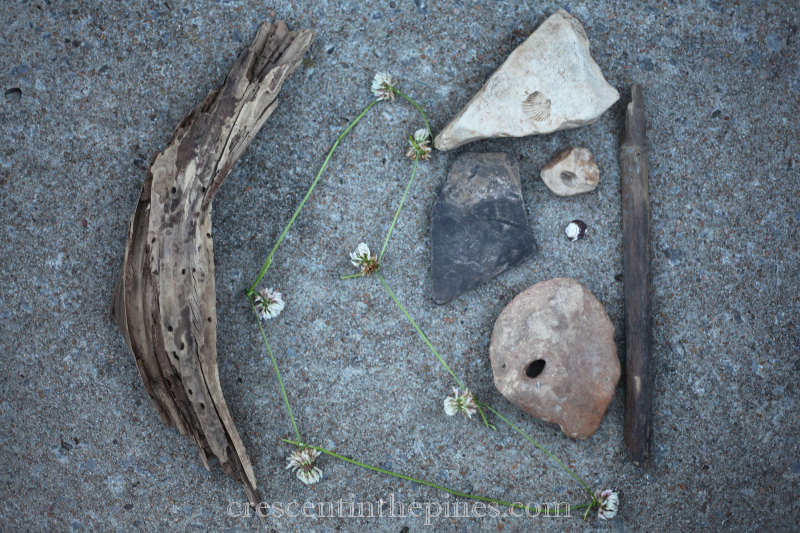 We scavenged a collection of rocks, driftwood, feathers, and shells, played in the late afternoon sunshine, and taught E to make daisy chains and how to improve her rock skipping game. And after dinner and a visit from a less than skittish raccoon, E had taken in all the excitement she could. Josh and I stayed up, watching one of the most beautiful moonrises I’ve ever seen, the sort of thing you can’t quite justly describe in words but it stays with you until the end, locked away forever in memory. The river whispered by, swift current and humble power, and we talked nonsense, relaxed, laughed. Awakened by the first light, campfire hash was first priority, as always. 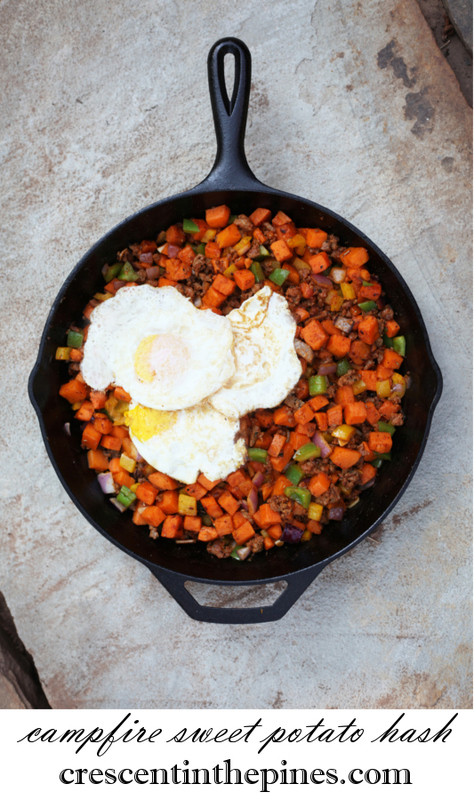 I adore a good sweet potato hash and this is my frequent go to for camping trips, although it can just as easily be made at home on the stove and is just as good then, almost. While the other ingredients remain the same, the meat used can vary with the evening prior’s meal so as to make the most of hauling the fewest possible ingredients. In this instance, our butcher had some amazing looking rosemary breakfast sausage that couldn’t be passed up, but bacon, sliced up smoked sausage, or even beef can be quite good. No matter the meat, it’s where this hash is eaten, there by the smoldering ashes, wrapped in the warmth of the early rising sun, steeped in laughter and the lingering scent of campfire smoke that make this a meal to cherish. Heat a few tablespoons of oil in a large cast iron skillet over campfire (or med-high heat if cooking on stove), and add sausage. Just as the meat begins to brown, add the sweet potatoes. Spread them out as much as possible so that they lay on the bottom of the skillet in a single layer. Cook the potatoes until they begin to brown, about 5 minutes. Toss the potatoes frequently until most of their sides are lightly browned and the sausage is cooked thru, 3 to 5 minutes longer. Then add the onions, garlic, peppers, green onions, and spice mix with a dash each of salt and pepper. Toss continuously until the peppers and onions are just cooked, about 2 to 3 minutes. 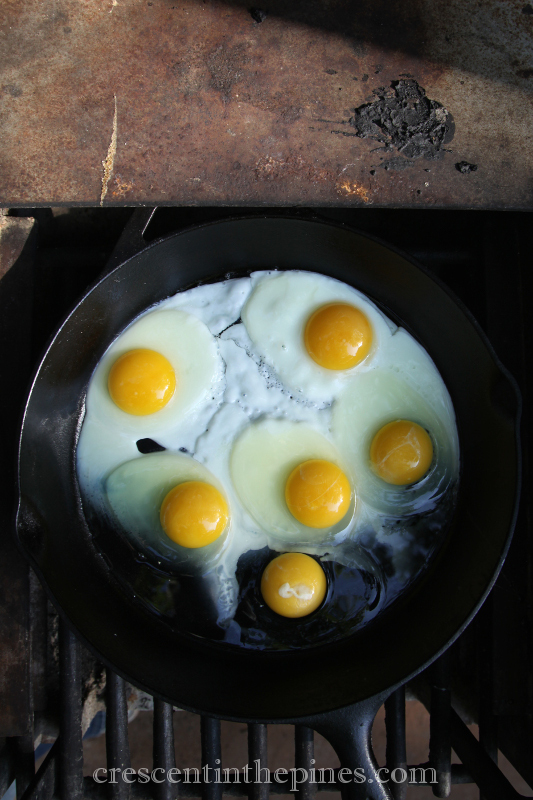 Separately, fry eggs to desired level of doneness. Serve hash topped with one or two eggs per serving and garnished with hot sauce and leftover sliced green onion tops, if desired. For camping purposes, you can pregame by having your vegetables diced in advanced and mixing the spices ahead of time so that they can be carried in a single container. Pingback: Delicious campfire recipes for your next family camping trip.